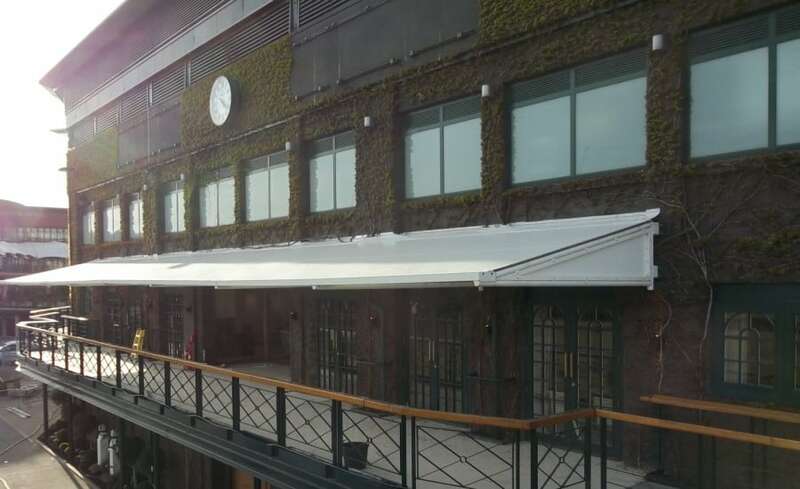 The All England Lawn Tennis Club (AELTC) has been undergoing a dramatic refurbishment from the inside out. AELTC is best known for Wimbledon, the venue which hosts the oldest tennis tournament in the world and the only Grand Slam still held on grass. 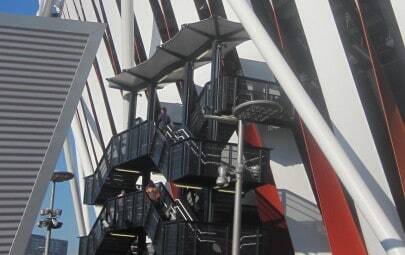 Part of the refurbishment of the outside space called for the replacement of three existing canopies over the terraces. The terraces provide sweeping views of the outdoor practice court. 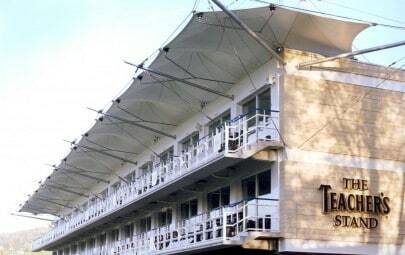 The fabric canopies, originally made of PTFE, were in need of replacement – Architen Landrell was commissioned to do the job. 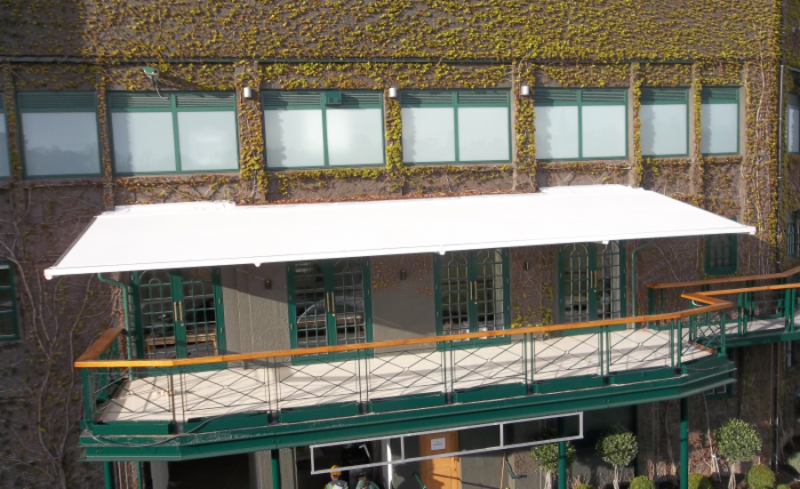 In keeping with the large retractable fabric roof over Wimbledon Centre Court, Tenara fabric was chosen for the canopy replacements. Tenara is known for its excellent light transmission (up to 38%), its long lifespan 30+ years and Class 0 fire rating. 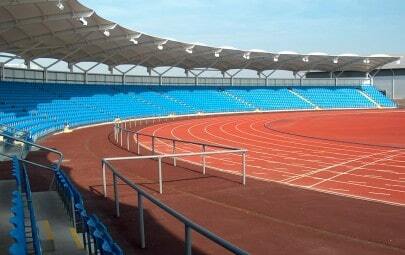 The terrace canopies are flat tensioned panel structures measuring: 2no 12x3m and 1no 24 x 3m. Each of the canopies is supported by a cantilevered steel support frame connected to the building. Gutters were also installed in order to divert rainwater away from the terraces. The bright white new canopies provide club members with unobstructed views of the practice courts – all under a space that is shaded on hot summer’s days, dry in the rain and naturally lit (even on the cloudy days). 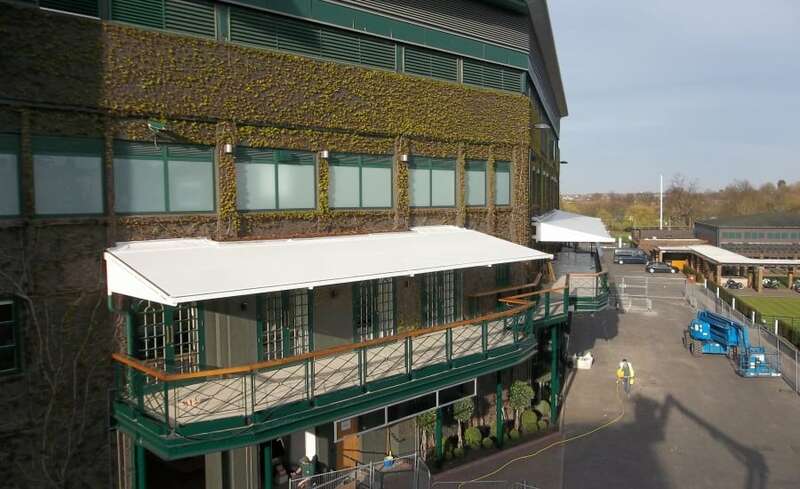 Installation was carried out by cherry pickers and rope access – ensuring a safe and rapid installation – all to meet a deadline of 21 March, the opening of the newly refurbished AELTC.